Today's post is on my recent work. Ali wanted her nails to correspond with a red dress that she was wearing for a night out but as she was going away for the weekend too she didn't want it to be specific to the dress. I adore red nails but I do think that it can sometimes be a difficult colour to match with when your client doesn't just want full colour. It goes beautifully with black, silver or gold however I feel like the silver and gold can make it look very 'Christmassy' and the black can make it quite a dark, almost gothic style look depending on how it's worn. 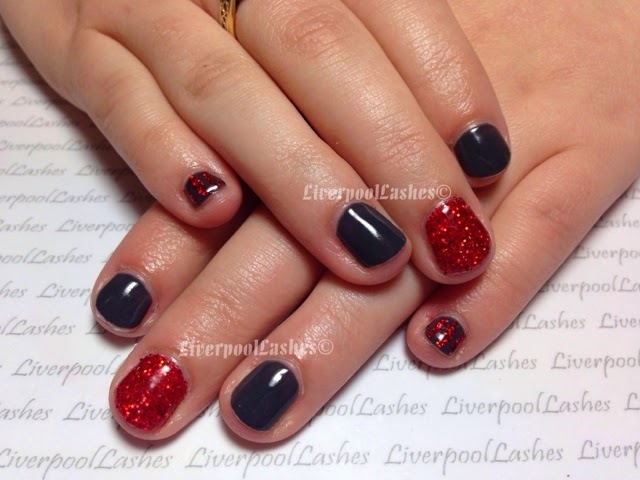 Ali went with Shellac Asphalt on all nails apart from her middle finger which I applied Shellac Hollywood and then Lecente Deep Red Glitter over. For her little finger I mixed a glitter paste and drew vertical lines down both of them. On her thumbs she chose a tulip print from MoYou XL Pro 07 which I printed in white and then used the glitter paste to fill in the petals. The best part was Ali looking at her nails in the end and saying that she wasn't too sure if she would like the grey but she actually loves it!